2. Aluminum connecting end cutting saw. This is the new machine type designed for the aluminum curtain-wall and lighting skylight processing industry. It has the features of easy operation, reliable performance, advanced technique and convenient maintenance etc. 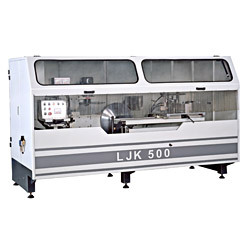 The machine is mainly used for processing the aluminum curtain-wall and lighting skylight profiles. The carbide saw blade ensured high processing accurate and efficiency. The two saw heads can work simultaneously to achieve the processing of a special angle at the profile end surface. 1. Used for processing the end surface angle of the aluminum curtain-wall and lighting skylight profiles. 2. The two saw blades can swing freely at + / -45° 3. Equipped with magnetic ruler control system, realized cutting angle and worktable height digital display. 4. Convenient worktable and locating device adjustment, can achieve special end surface angle processing.